The Princess (Page in the Rider-Waite tradition) of Disks is the card representing the personality that arises from the Earthy part of Earth. It symbolizes the kind of person who represents the Earth of Earth; the most stubborn, materialistic, practical person you’ve ever met. 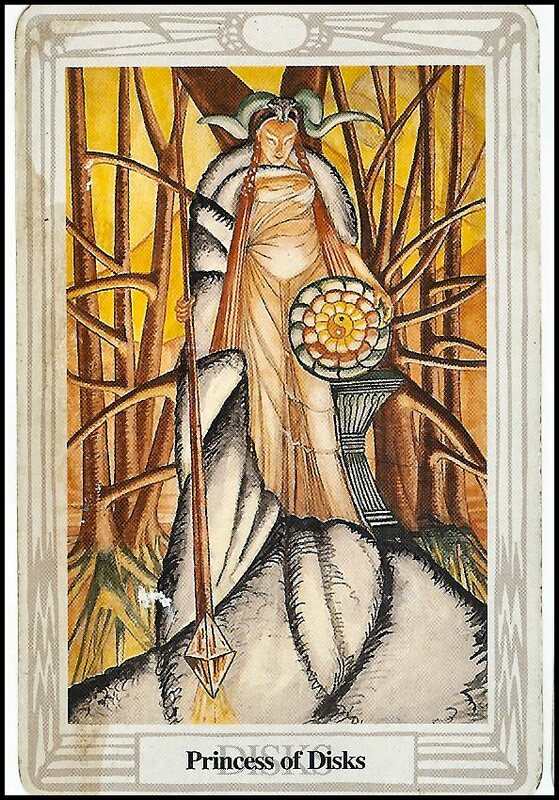 She also represents the end of the cycle, and the start of the new; while the Knight of Wands represents the person who goes out and creates things in the world, the Princess of Disks is the person who givesBirth to the Knight. She is the soon-to-be-mother; the pregnant woman. She represents the Potential of life, and Ultimate Womanhood. She is the force that stands behind the force of Creation, who Carries the Future with her. She is alsoStrong and Beautiful, in both human and Earthy terms, making her also Sublime. She is on the Brink of Transformation. She represents the ability of the Earth to give birth to new life (while the Queen of Disks represents the Earth’s ability to care for this life). She is also extremely Stubborn and Thoughtful, able to survive by applying herPracticality, and doing anything to protect the future that she holds in her womb. She will not take needless risks, and can move mountains to get her way, and will not let anything stand between her and what she needs. The Rider-Waite art shows a young man looking at a Pentacle in his hands, as if considering what he can do with it. Similar signs of potential and growth surround him in the green grass and trees in the distance, as well as sublime mountains in the background. The Thoth illustration shows a woman with horns (signifying fertility) looking down at her swollen stomach (indicating pregnancy), while cradling a flowering Disk with a Yin-Yang (symbol of balance and completion) in one hand. In her other is a spear, pointed at the ground, and it looks as if it has just been used. Power flows out from it, and she stands upon what is either a rock or a slain beast. She will use her spear to defend her unborn child, and will let nothing get in her way. Behind her, trees grow larger like the child in her womb does. In a reading, this card asks you to examine the role that people with this personality play in your life. Do you know anyone who has lots of potential, and seems to hold the key to the future? Who is strong, beautiful, and doesn’t take any nonsense from others? Reversed, this personality’s energy is twisted or hidden somehow; their potential could be hidden somehow, or perhaps this potential is not a positive thing for the future.